Just watched an excellent program about Sir Bobby Charlton, he is undoubtedly one of the true gentlemen and ambassadors of Sport. He demonstrated a life long commitment to one single football team, Manchester United with a loyalty that can only be matched by a few people today. I met him once, nearly 20 years ago, only fleetingly, but as a lifelong supporter of the Reds, it is a moment that I will not forget. We were at kids football event, somewhere in Manchester, one of my colleague’s sons was playing. I was on the touchline holding my one year old daughter, Bobby was running up and down the line and he was talking to all the parents, offering words of support. He took one look at my daughter and commented on what a lovely shock of dark hair she had. He had time for everyone and just left you with the feeling that he was such a genuinely nice person. As a United fan, born and bred in Yorkshire and now living in the North East, I have endured the comments that all fans, that were not born within a stones throw from Old Trafford, have had to endure. I think that I must have been influenced by my Godfather, around about the time of the 1968 European Cup Final. All I remember is that I have have been a supporter for as long as I can remember. I also remember that the seventies and early eighties (except for the odd cup) was not the best time for United supporters, Liverpool were the team. Obviously the Ferguson years have now made United a team to be jealous of. I thought I would share this memory because of the passions that the Bobby Charlton program bring to mind. Some people like to try to understand what drives people to success. I think that personally I have been extremely lucky. I set up my company over 12 years ago, I gained some experiences in a number of companies within the battery industry, I learnt a lot from some great people, some of whom I am still in contact. I had something in my character that would never let me settle with second best, I always wanted to improve things. I became frustrated that I could not control my own future and direction and eventually came to the realisation that I could only achieve this if I became my own boss. Over the years, I built up a great team of people and a great little company. I have met some great people and I love to learn from the positves that these people can exude. The characteristics that I like to see are fervent loyalty to the cause, passion, absolute positive mental attitude, honesty, integrity, high standards, total can do attitude, hard working and a desire to continually self improve, the ability to motivate other people. The ability to look at problems and see the opportunity to learn and solve the problem. Patience and attention to detail also helps. It is easy to work out what would turn me off, negativity and whinging are close to the top of the list. I believe that everyone has the ability to make a positive mark on any aspect of their lives and careers, they can be influenced by others but they have to have that inner drive and desire. I recommend that people should read Alan Sugar‘s books for some inspiration, there are lots of others out there such as Alex Ferguson‘s and Sir Bobby Charlton’s to name two. I also thought I would add the picture I took, from a recent visit to Old Trafford. 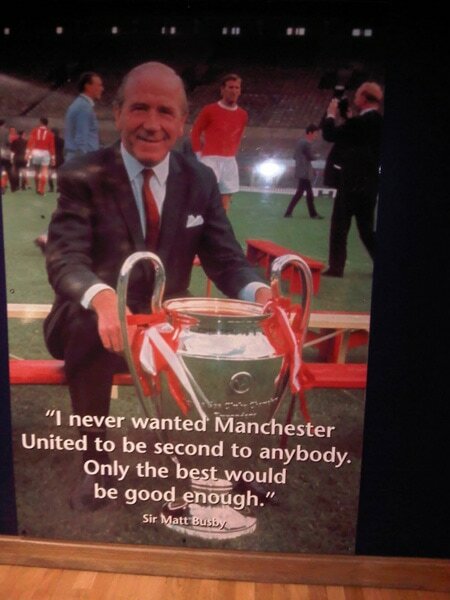 A fantastic image of Sir Matt Busby holding the European Cup.